I’m launching my first paid writing workshop as a way to serve seasonal residents in Naples — and as a way to make some money doing what I love most. For the past three years, I have overseen a free writing workshop for local writers working on fiction and literary nonfiction. About six months ago, we began a second group for novel writers. But with so much interest from seasonal Floridians, I decided to start a 13-week paid workshop beginning in January. This way, Neapolitans who aren’t here year round but still want to partake in a workshop can have a place to share their writing and learn some skills along the way. The session has a set curriculum and three speakers, and will culminate in a public reading. Registration is now open. Our speakers this year are author Artis Henderson whose memoir Un-remarried Widow chronicles her life after losing her husband Miles in the Iraq war. Ben Bova is the author of more than 120 science fiction and science nonfiction books. He’s also a six-time winner of the Hugo Award. And Thomas Dunne is a publisher at St. Martin’s Press where he has overseen an imprint by his own name since 1986. For $250, you’ll get 13 weeks of instruction, attendance to all three speakers and time to share your work with fellow workshop members. If you’re interested, please email me for details. I still make it a point to do the occasional feature on the side, as a way of keeping up my freelance chops. Here are links to a few recent clips. Recent seems like a loose term, given that I started one of these stories back in January. But that’s how magazine deadlines roll! This story featured the two founders of a burlesque amateur dance group in Naples. The magazine ran the submitted art as its cover and also gave it good play inside. This was a fun and interesting profile about a local artist whose modern, abstract work was a challenge for me to write about and describe. I think I managed, and the accompanying photos happened to be shot by a friend of mine, Michelle Tricca. Photo by Michelle Tricca, featuring artist Dana Roes. This image ran in Gulfshore Life magazine in October. Each year Florida Weekly holds a writing contest using photos as prompts. I submitted a story this year after a Naples Writers’ Workshop member suggested we all compete. I was shocked to learn I won out of the more than 250 submissions. My prize was a ticket to the Sanibel Island Writers Conference the first weekend in November. Attending the conference was another first for me, and now I’m sold on the paid writing workshops. I spent the weekend taking lessons from local and national published writers and attended the panels and readings they offered. Budget permitting, I’m hoping to make writing conferences a regular thing. You can read my winning submission through Florida Weekly. Read about their contest, too. Plus, learn more about the Sanibel conference. About a year ago I read a story by Sheryl James, formerly with the St. Pete Times, who wrote about a baby thrown in a dumpster and left for dead in a local suburb. The story covered the child’s recovery and the court case that ensued after authorities found his birth mother. You can read Sheryl’s story here. Shery’s story went on to win the Pulizter for features. And when I read it, I latched onto a bit about another abandoned infant found in Naples in 1988. I spent about a year periodically digging until I found the boy. 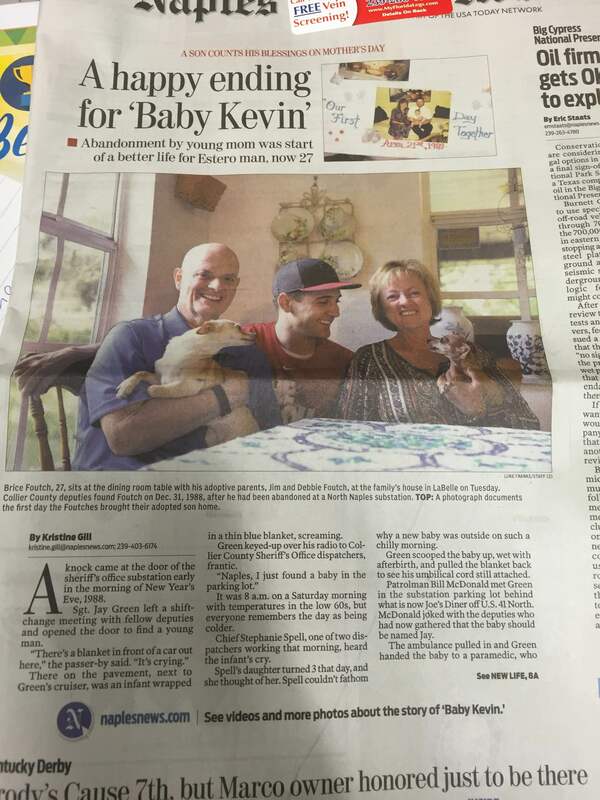 He’s 27 now, and the story I wrote for Sunday’s Mother’s Day edition details his own abandonment and adoption. It’s probably the piece I’m most proud of from the past year or so. And the family was great to work with. Check out the story here. Photos by Luke Franke and Calvin Mattheis. I heard about students from our local university going up to help a sheriff’s office in another county crack a 30-year-old cold case. Six students in a forensic anthropology class at Florida Gulf Coast University went to Martin County to help authorities unearth the remains of two unidentified infants. One of the children is Baby Moses, a child who was thrown into the river and drowned the day he was born. Authorities later buried the child in an unmarked grave. When the case was reopened this fall, detectives decided they needed to exhume Baby Moses to collect potential DNA evidence. The story I got to write took a look at the cold case itself as well as the graduate program at FGCU. What these students do is so neat and to be able to practice it first hand as a student is even cooler. I’m really happy with how this centerpiece turned out. Does this mean I can get a Wikipedia page now? On Friday, we got a press release about a woman whose body was found in the Everglades back in 1990. For 25 years she went unidentified as the victim of a homicide. Then this summer, forensics experts in Texas matched her DNA to that of a woman whose mother went missing around the same time. 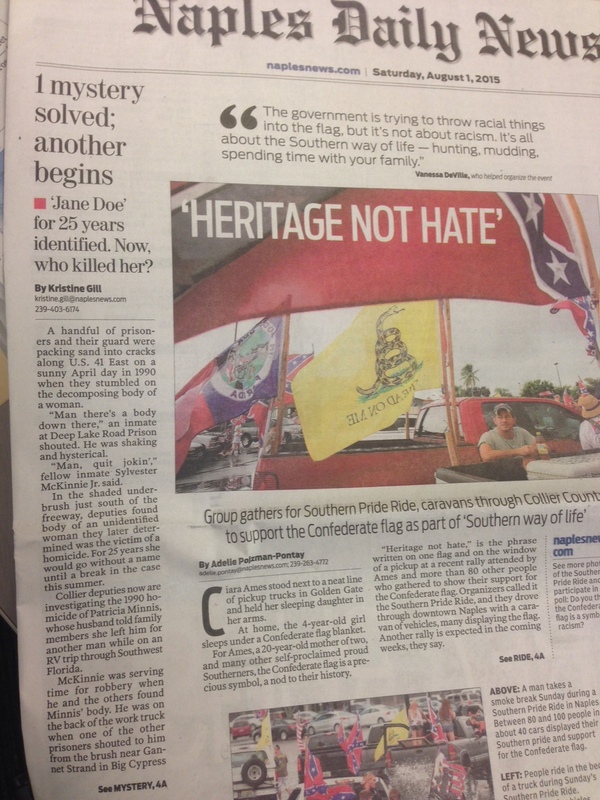 The Aug. 1, 2015 issue of the Naples Daily News. The story I wrote for Saturday’s paper details the gruesome discovery of the body by a group of prison workers who were repairing a road through Big Cypress National Preserve that day in August when they discovered the woman. The woman, Patricia Minnis, was reported missing from Turlock, California in 1992. I wasn’t able to contact any surviving family members, but I did interview ones of the former prisoners who found her body that day. It made for a compelling lead. Deputies here say they have a person of interest in the case but no arrests have been made. A couple of months ago, I started a writing blog along with fellow reporter Jessica Lipscomb. Each week, a group of Naples Daily News reporters meets to talk about how a reporter pulled off a story that we read and liked. Hence the name of our blog: storieswereadandliked.com. Jessica and I take turns interviewing the journalists behind the stories for more insight into how they reported and wrote each piece. Often, the stories are narrative or long-form, but we’ve also looked at daily stories and columns. So far the group has been pretty productive, and the blog is our way of sharing what we discuss for those who can’t attend in person. Check it out! For the past few weeks, I’ve been recording a two-minute radio spot to be used on B103.9’s internet radio station. This week, I started a new weekly spot for Fox News 92.5. Each Thursday at 7:38 a.m., I’ll call in to the local radio station to give an update of Collier County news and the biggest stories we’ve had that week. This is a podcast of the first recording. I spent a few months with photographer Dania Maxwell checking in on a Lehigh Acres family whose daughter just started attending school as a girl. We wrote about Dee-Vyne Valentine’s transition from Dante Valentine and explored what the future will look like for this young girl, who also has learning disabilities. I hope we’ve brought some awareness to the issue locally and that by publishing a story like this, we can pave the way as a society for other girls like Dee.